Restrictions on iPhone or iPad prevent a user from making many changes to the devices settings and allow the disabling of various iOS features, including some apps, functionalities, to disallow certain content types, and the ability to prevent making in-app purchases or buying from the App Store. Restrictions are very commonly used by parents to make a kid friendly iPhone or iPad, and iOS restrictions are also frequently used in academic and public environments to limit a device in various ways. Restrictions are an excellent feature of iOS, but what happens if you forget the Restrictions password in iOS? 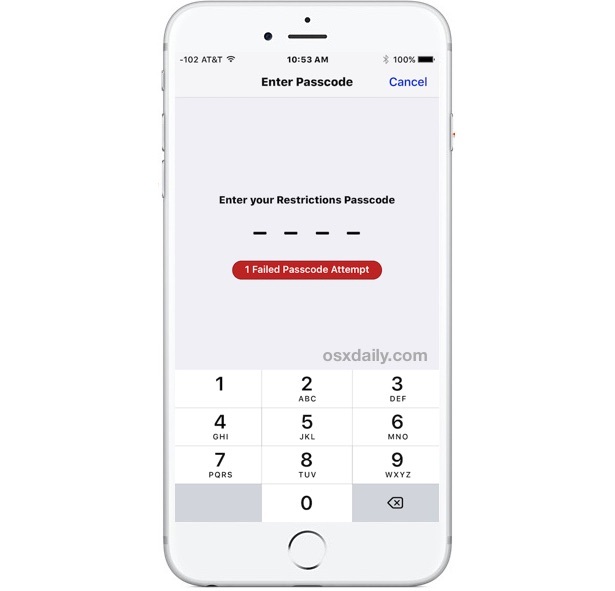 Can you reset a forgotten Restrictions passcode on iPhone or iPad? How do you remove a Restrictions passcode if you don’t know the password? These are all valid questions, be sure to read thoroughly below to learn how to work with the scenario of a lost restrictions password. First, remember that the iOS Restrictions passcode is separate and different from the general iOS device passcode that locks down the screen. Sometimes users may set the Restrictions passcode to be the same as the lock screen passcode, and if you have forgotten a restrictions passcode it’s a good place to start. It is highly recommended to attempt to recall or obtain the set Restrictions passcode. Ask family member(s), systems administrators, or anyone else who may know. If you can’t come up with the password, the device must be erased. In order to reset a restrictions passcode on iPhone or iPad you must reset the entire iPhone or iPad to factory settings and set it up as new, meaning it will wipe and erase everything on the device. All content, pictures, movies, notes, contacts, everything will be removed with the restrictions passcode. Back up the iPhone, iPad, or iPod touch before beginning. It is highly recommended to backup the device to both iTunes and iCloud. Keep in mind this will format and erase the device in order to remove the Restrictions passcode, meaning all data on the device will be lost. 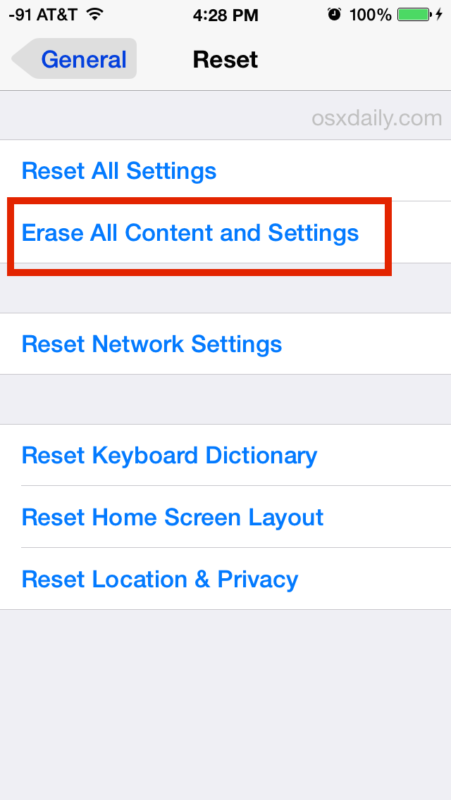 The iPhone or iPad will reset and erase everything, including the Restrictions passcode. When the device starts up again, you must set it up as new. This is obviously rather dramatic, which is perhaps why it’s not recommended for all but the most dire of situations where removing a Restrictions passcode is necessary and critical, and after the user has adequately backed up all data, pictures, notes, and other important information from a device. Keep in mind if you restore a backup made with the prior Restrictions passcode, you will be restoring the same Restrictions password back to the device. This is why you must set the device up as new, and you should have manually backed up data from the device. The iTunes and iCloud backups are made to be sure you don’t lose any data, since you can restore to them and copy data off before committing the device erasure. How to Reset a Restrictions Passcode without iPhone / iPad Restore? There is a sometimes referenced and fairly complicated method which attempts to reveal and crack the Restrictions passcode by using third party software on an unencrypted iTunes backup of an iOS device, you may find it elsewhere on the web but it often involves downloading dubious third party software which is not recommended for security reasons. We do not recommend using this approach for a number of reasons, not the least of which being that is limited and rarely works. If you are a highly technical user who understands how to install software in the terminal, mitigate risk, and understands and accepts all of the risks associated with attempting to crack a passcode, and you are still committed to trying such a method, you can find fairly advanced instructions here to attempt it yourself. Another advanced approach is discussed here. These are not recommended, and may not work. Be sure to backup your device (and your computer) before doing so. Is there any other way to reset a lost Restrictions passcode in iOS? You can also erase and setup as new an iPhone or iPad with iTunes. That will also remove and reset the Restrictions passcode. You could attempt to contact Apple Support, but most likely they will not be able to assist beyond erasing the device as there is no known way to bypass a restrictions passcode in iOS. This is implemented for broader security reasons. Thus, absent the ability to remember the restrictions passcode or crack it, you must erase the iOS device to get around the forgotten restrictions passcode. While educated guesses are OK (as in, “it could be x, y, or z”), guessing wildly is not a particularly good idea. Attempting to continuously guess the Restrictions passcode will eventually lock down Restrictions passcode entry entry entirely, similar to the “iPhone is disabled” message which requires either waiting a while to resume password entry, or a connection to iTunes to remedy. Why do Restrictions on iOS exist at all? Restrictions are a very popular feature for parents, educators, and systems administrators. You can think of Restrictions essentially as Parental Controls for iOS and they allow for a myriad of abilities to lock down a device or make it more friendly to certain user groups, with abilities to stop app access, blocking adult content in Safari, disable the iPhone camera completely, disable in-app purchases, and much more. Do you know of another way to reset a Restrictions passcode on iPhone or iPad? Share it with us in the comments below! More Apple madness! I have moved to iOS 10 on the iPhone but not the iPad. Searching from the iOS 9 iPad finds nothing about this brand new password that I’ve never heard of before. But searching iOS 10 on the phone finds it. Another useless thing I don’t need. Nor was I asked to enter one when I moved to iOS 10. Why not? I was forced to enter a new and useless (to me) code for low power mode. Now there’s yet ANOTHER password? Why wasn’t I asked to create it? I have zero need. I live alone, not interested in Apple Pay, or restricting content for children. How much longer till I just say, Apple is overly complex for my needs. Too many features I have no interest in (no, I’m don’t want to talk to it, etc). Anne, you don’t have to use a feature just because it exists. I know many people with iPhones who do not use various features on it, and I know people with SUV who don’t use 4wd. But if you did have kids you’d probably like having restrictions on the phone to prevent them from looking at weird stuff or buying stuff! If you don’t need to reset a restrictions passcode, don’t worry about it! So sorry. It’s not new. I have never heard of it. Now I’m in a panic thinking I’ll suddenly need it! I was thinking of buying a new iPad and giving mine to a computer illiterate friend (same age as me, 65, but I worked as a programmer for my entire career). She can use a cell phone but email is very difficult for her. I thought I could teach her. Now I’m thinking this might not be a suitable item for her. Way too many things she doesn’t need. Does ANYONE make “simple” tablets? Anne go with a Samsung tablet, uou are not locked in to the apple way of doing things. You will be much happier. No way to erase all of the data without the 4 digit restriction code. Be aware, the you will need your itunes login to activate the iPad. Otherwise you will brick your device. These instructions helped me remove the ‘Restrictions Code’ that we’d setup to prevent inApp purchases. Seriously, make sure you know your itunes login before attempting this. Hi Anne. I’ve got you beat by 5 years (now 70) and living in a CCRC, retired after 30 years supporting computing at a major research university. Consequently, I am one of the “resident” computer Gurus — and I’m THE Apple expert here. Your problem is NOT unusual, nor is there an easy solution. I am constantly confronted by 70 and 80 year olds who have received iPads as Christmas gifts from their GRANDCHILDREN!!! (3 more so far this year) – primarily so they can exchange pictures and email. The first thing I try to do is to “clean-up” the “desktop” — put the Photos, camera, mail and settings apps in the dock and across the main screen. Then consolidate everything else into a single “bucket” – the app Store, iTunes, TV, Music Player, all those Apple issued apps that you can’t delete. Then delete any others. That helps, but does not alleviate the problem as it is too simple to get into something accidentally. Teaching folks to use the “home” button to get out of thing they don’t understand is probably the most important concept. On the iPad “swiping” (left and right, up and down) is an important concept, probably more important than the mechanical gesture! It is a completely foreign concept outside of the touch-screen computer world. The folks need to practice doing a swipe till they understand that finger or hand movements on the screen can accidentally “swipe” in some direction. It’s a manual dexterity thing. Kind of like Physical Therapy. If the person has only one device, you are ahead of the game. But if they have an iPhone AND an iPad there is trouble. . . those two devices, while similar, are NOT identical in their behavior. And if they also have an Apple laptop, let alone an iMac, things behave very differently across all 3 platforms and keeping their actions sorted out is challenging. As far as simple devices are concerned. The simple answer is no, there are no “simple devices.” They all require a basic conceptual framework, that anyone over about 15 simply does not have! Remember, the first iPhone was introduced in 2007. Before that there simply were no “smart devices” — less than 10 years ago! It may not be such a good idea. I could let her try it first. You also likely have vastly more experience with Apple devices. Most of my career was programming mainframes. So much taken care of for you. And say what you will about an IBM mainframe, there aren’t many bugs in the operating system. Can’t say that about PCs and mobiles. …a further thought. To help with the hand-eye coordination a stand/support for the tablet can be helpful. It minimises the ‘moving target’ problem which occurs when the user is holding the device in one hand while trying to touch the screen in an accurate and controlled way using their other hand. A stylus can also be useful for persons with larger fingers. This actually does not work. This restrictions password is set up for the erase all content and data as well. After putting in your passcode, it will then ask for your restrictions password. As far as the first way to do it. You reset the iPhone to remove restrictions password, you can also do it from iTunes and it works fine to remove the restrictions passcode. The passcode to reset iPhone is the normal passcode. Right, I’m trying to reset my kids devices, in order to erase all content, I need the damn passcode! I wrote the “pinfinder” utility that’s mentioned in one of the “How to Reset a Restrictions Passcode without iPhone / iPad Restore?” blog posts. I wrote it as, like everyone else, i was frustrated that the only other option was wiping the device, jailbreaking it, paying for a program i couldn’t vet, or performing a whole bunch of manual steps. I thought it would be useful to solve it once with a simple one-click program so that anyone else (friends, family, the rest of the Internet!) could recover their own passcode without having to pay or jump through hoops. Thus if you’re stuck with an iPhone, iPod Touch or iPad with a restrictions code you don’t remember, i’d definitely suggest you give it a try – It should work even for devices running the latest iOS 10, and if it doesn’t I’d like to know so I can fix it. It’s been downloaded over 25,000 times so far and I’ve had a lot of nice feedback about it. Pinfinder is a good tool to retrieve a lost Restrictions password, but it requires the iTunes backup to be unencrypted. And we all know how easy it is to lose the iTunes encryption password too…. Apple has so many passwords it’s kind of silly, it’s no wonder people forget them. True, though assuming you have the device it’s easy enough to backup another backup with iTunes with the encryption checkbox turned off and then you should be set. Even if I just opened my computer to the Russians, it was totally worth it because your hack worked like a charm. We couldn’t turn off restrictions for over two years because the code was mis-entered and we couldn’t figure it out. When we got a new phone yesterday and the restriction migrated to the new phone, I had had enough. Made a donation to your site as well. Thanks again. Gareth, you’re a marvel! One of our grandchildren enabled restrictions on my wife’s iPhone including a setting which prevented deletion of apps. Excellent – Glad it helped you out! You are the man! That worked so well and ez! Worked perfectly, thank you!!! Everyone, try this first. Super easy. You, sir, are a gentleman and a scholar! I’d tried everything else under the sun to reset my son’s old iPad, and nothing worked, not even erase from Find my Phone. Your little script is a gem! You solved a BIG problem! Pin finder worked for me. Thanks for the concise how-to. This is very helpful and easy to follow. This worked on me. Gareth, you are such a boss! Saved me hours of job resetting my phone. Big thanks! Pinfinder totally worked – you are the BEST!!! Thank you!! Sorry Gareth! Thank u Gareth! GARETH, YOU GENIUS. We have been trying to crack a work iPad for 18 months (off and on, not non-stop). This worked in seconds. You are a saint. I will definitely be donating. Great – Glad it worked for you and appreciate the donation very much! Pinfinder also recently got a new website: https://pinfinder.net – Still free to download and use. Pinfinder was so easy to use! It worked so quickly that my head was spinning! :-) Thanks Gareth! Wen I’m trying to reset it it’s asking me first for the pass code from my main screen then it asks me for the restrictions passcode 😩 can anyone help me out.? i have forgotten my password for iphone 7, so how can you to help me?